Please note: This is a beginners tutorial, so don't expect to find neat professional tricks, there's just the basics here. 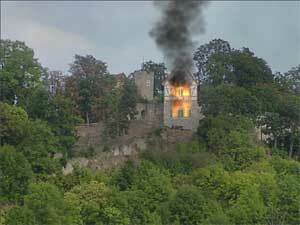 In this tutorial we are going to use some simple operators (draw selection, remove selection, turbulence and particles) to make it look like the castle you see on the picture is burning. The intent of this is to show how selections and particles can be combined to make some elements of the picture appear to be before and some elements appear to be behind the particle effects. In order to follow this tutorial you first should download the picture we are going to use in our composite. After clicking OK you should see your new composite in the viewport and the workspace. 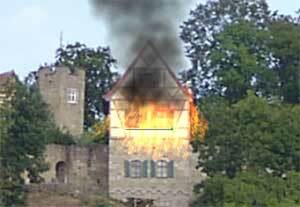 Now we have to import the bitmap of the castle we want to work with. Do that by right-clicking your composite in the workspace panel and selecting Import Footage. In the following dialog locate the bitmap on your filesystem, mark it for import by clicking on it and then click OK. The picture should now be visible in your viewport. Before we start playing with fire let's first darken the sky and get some 'smoky' effect onto it so the atmosphere of the picture will be darker and more fitting to the mood of destruction it soon will get. :-) We will do this using the Turbulence operator which is one of the many effects coming with combustion. Before applying the operator we want to make shure that it only affects the parts of the picture we want it to affect (eg the sky). To achieve this we are going to draw a selection: Extent the listview in the workspace by clicking on the triangles left of the entries as seen on the picture below. 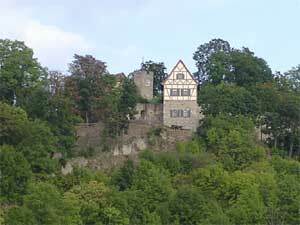 All operator we are going to use in our project will be directly applied to the 'tut1_castle' layer, not the composite itself. Important: Whenever applying a new operator which should last the whole duration of the video, make shure you are at frame 1 of your comp. The operator will always start at the frame you were looking at when applying it. Right-Click the tut1_castle layer and choose Operators -> Selections -> Draw Selection from the list. 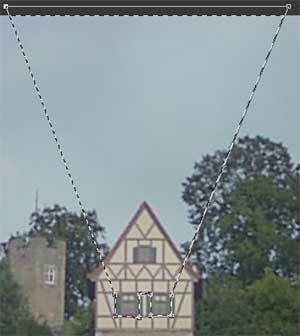 The selected operator appears in your workspace (as first operator in your castle-layer) and the viewport ist automatically switched to the output of the Draw Selection operator. 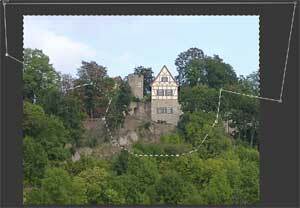 If you move your mouse above the viewport you see that the pointer changes to a blue crosshair which means you are ready to go - draw a selection (set a point by left clicking your mouse, backspace to delete the last point) containing the sky, the castle and parts of the treetops as seen in the picture below. To finish the selection position your mouse over the first point of the selection. The color of the mouse pointer changes to yellow. Now left-click once more and your selection is finished. After you finished drawing the selection you will notice a new item in the workspace-list, namely a Polygon Selection under the Draw Selection entry. If it is not already selected do so. Right of the workspace panel you can see the Selection Controls. Select Modes and change the Feather value to 25 which will soften the edges of the selection. Also be shure the Anti-Alias option is checked. If you still don't see any change in the viewport window most probably you still are looking at the output of the Draw Selection operator in your viewport. Change this by double-clicking on the Composite in the workspace panel. If we preview our composite we see that the turbulence effect does not move. We will now change that by animating the Time Slice value in the Turbulence Controls. Click once on the Animate button - it changes to red indicating that all changes made to any option will automatically generate keyframes. 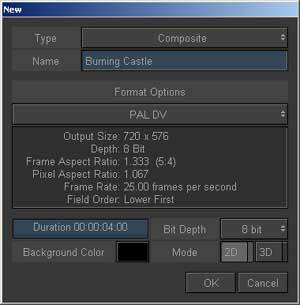 After activating Animate go to the first frame of your composite and change the value for Time Slice to '1.10'. Then go to the last frame of the composite and change the value to '1.40'. Click the Animate button again to deactivate auto-keyframing (it is never good to forget that, it can screw up your composite real good.. ;-). Now preview your composite by hitting space or by clicking the play button on the playback controls. The Turbulence operator makes it appear as though there is smoke in the air which billows slowly. The turbulence only affects the parts of your composite wich were chosen by drawing the selection before. If you don't believe that just temporarily deactive the Draw Selection operator by left-clicking on the yellow-highlighted brush symbol left of it (in workspace panel). You will see that the turbulence now affects the whole image. Reactivate the operator and prepare for some hot effects in the next part of this tutorial. Don't forget to go back to frame 1 before applying the next operator. We now want to make the composite look like there is a fire inside the building which is blowing/leaking from the inside out of the windows. For this purpose we have to draw another selection. Before this we have to get rid of the old selection we drew before to mask out the Turbulence operator. Right click your castle-layer and select Operators -> Selections -> Remove Selection. This causes all newly added operators not to be affected by the old selection. (All operators seen in the workspace panel above a selection are affected by it, until a Remove Selection explicitly deactivates it - now only the operators 'sandwiched' between the Selection and the Remove Selection are affected. When you are finished drawing it, change the Feather value in the Selection Controls of the new Polygon Selection to '2'. Okay - so now we are finally ready to add some nice particles to our composite. 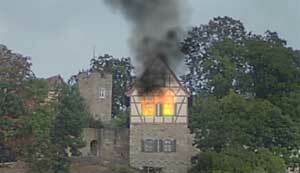 Right-click on the castle-layer, then select Operators -> Particles..... The operator will be added to your layer and its output is automatically sent to the viewport. Note: As we will apply the particle emitter it will look like the selection we just drew will have no effect on the particles. This is normal, everything will look fine as soon as we change the viewport back to the output of the whole composite. So, after applying the Particles operator we see the Particle Controls on the right side of the workspace panel (see picture above). There are quite a few sub-entries (Library, Emitter, Transform, Particles, Behaviour etc) of which only two are of interest right now. Okay, click on the first button, Library. There you will get an overview of the premade particle emitters inside the currently loaded particle library which normally should be the default library. 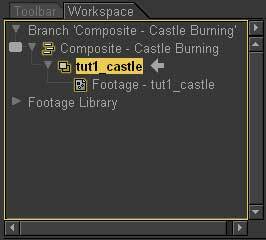 As the particle effect we want to add here is not in the default library we first have to load another one: Click on the Load Library... button and select the fire.elc library. After it loaded search the list for the Flames with smoke 2 preset. Once you found it double click it to activate the standard drawing-tool for the emitter. (This sometimes is a bit tricky, alternatively just select it, change to the toolbar panel and click on the Line Emitter Tool). Now position your mouse a little below the lower left corner of the left window and click once. A green point should occur there. Then move the mouse to the right until you are a little below the lower right corner of the right window and click again. A second point occurs and together with the first one creates a line. We now have created the emitter for our particles. Next, click on the Emitter button of the Particle Controls and change the value of the Preload Frames option to '65'. Double click on the composite to view its output in the viewport. Now you can see the selection affecting the particle operator. (A similar effect can be achieved by using particle-deflectors but those are more cpu-hungry). Now it's time for you to play aroung a little bit: Apply the same effect to the lower windows of the building by adding another group of Remove Selection/Draw Selection/Particles operator just as we did before. As we are working on a still-frame it can't hurt to add some grain to the composite as otherwise it will be quite noticable if we cut it together with 'normal' video. Do this by right-clicking your composite in the workspace panel, then selecting Add Operator -> Grain Management -> Add Grain. Play around with the Add Grain Controls until you are satisfied with the result.